← An import by any other name? Man, the picture is so beautiful! A couple of months ago I did a post on the only firm making TVs in this country: Element Electronics. Well, it seems that the firm is starting to really get rolling. Element was featured on NBC news the day before yesterday and their production quota for the year is already sold out. Element is starting slow and running only one production line employing around a 100 people. They are assembling their larger 40″ and 50″ flat panels at their facility in Canton, Michigan outside Detroit. CEO and founder of Element Electronics, Mike O’Shaughnessy is hoping to find domestic component manufacturers so he doesn’t have to use Chinese parts in Element TVs. The Element call center, refurbishment, and repair are all centralized at the Canton shop. 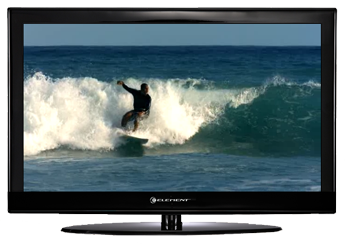 In an encouraging sign, Element TVs made by members of our extended American are being offered at lots of big box retailers. Hell, even Wal-Mart is selling Element TVs. I am a big softie about a lot of things and often get quite emotional when I experience interactions with my family, puppies, you name it. But I was almost blubbering as I watched the NBC video and listened to those workers who had been laid off but now are working again thanks to Mr. O’Shaughnessy’s vision to once again make TVs in America. Mr. O’Shaugnessy has officially moved into my pantheon of American manufacturing heroes along with George Feldstein, Karen Kane, Joe Wells III and Robert Chesebro, Jr. The reason I am writing my book, Simply American, Putting our Extended American Family Back to Work, and the reason why I am writing this blog is to encourage Americans like you to buy more products like Element TVs because if you do, unemployed Americans will become employed Americans. Not rocket science I admit, but just because it’s simple doesn’t mean it is not critically important. If you have ever been close to someone who has suffered through long-term unemployment, you will know why I think it is imperative that we find a way to put people in this country back to work. To see a bright, wonderful person get battered by yet another rejection after yet another job interview is very difficult to watch. We can put people in this country back to work by buying American made products. The reason this is possible is because there is a lot of room to substitute American made products for products made abroad. We ran a $300 billion goods deficit with our pals in China last year. People a lot smarter than me estimate that for each $100 billion in goods that we consume that are made here, as opposed to being made there, creates one million American jobs. Substitute American goods for foreign goods = more American jobs. I think I could remember that for a test even without the aid of a notecard. I drink quite a bit of coffee; remember I live in Seattle. So sometimes I make three trips to my local coffee-house over the course of a day. I could try to boost employment in the service sector in Seattle by doubling my coffee consumption and drinking six cups, as opposed to my current three cups. But that is simply not an option for me; as much as I like coffee, I can’t manage six cups a day and not get fired or perhaps even arrested. But to increase employment in the manufacturing sector, we don’t have to increase our consumption of the consumer good, we just have to substitute an American good for a foreign good. If I currently have a pair of jeans made in China and when they wear out I buy a pair of Buddy Jeans, I still have only one pair of jeans, but I have helped create the need for an American worker without having to increase the number of pairs of jeans in my wardrobe or increasing my jeans purchasing budget since Buddy Jeans only cost $39.99. So it is a win for me, a win for the Buddy Jeans’ worker, and a win for America since our trade deficit with the Middle Kingdom just dropped by $39.99. And also a win for the American fabric firm that sells Buddy Jeans their cotton. Four wins, not bad. So, when your current TV goes on the fritz, buy an Element Flat panel. You will get a great TV and you will be helping to employ a member of your extended American family living in Canton, Michigan. Who knows, they might even invite you for a visit. This entry was posted in american made, Appliances, China, Made in America, made in usa and tagged China, Element Electronics, Imports, Made in America, Made in the USA, Trade, Trade Balance. Bookmark the permalink. 1 Response to Man, the picture is so beautiful! Great job on the Element Electronics TV. I will be looking for them. Regarding Buddy Jeans, they are one of many internet jean companies. Probably within the next week, I will publish a listing of clothing made in the US sold only via the internet. -Jack A.